Starting from the above passage, which produced a deep impression on me, I made a personal search into the classical texts of our school for the meaning of sangha. „Although there have been “meetings” everywhere each month, from the past up until now, there has never been anything at all that might be called a discussion of faith. In recent years in particular, when there have been meetings (wherever they have been), everyone has dispersed after nothing more than sake, rice, and tea. This is indeed contrary to the fundamental intent of the Buddha-Dharma. So nembutsu meetings between spiritual friends should be held for Dharma reasons only, for clearing our doubts and misunderstandings and for receiving shinjin. It is said that among the three kinds of offering or dana, the offering of Dharma is supreme, even more important than the saving of life, because through the Dharma one becomes free of birth and death. Thus, to help each other understand the Dharma is the best thing we can do for one another. It is an act of compassion even if we remain unenlightened people with ego centered personalities for the rest of our lives. “What is 'great compassion'? Those who continue solely in the nembutsu without any interruption will thereby be born without fail in the land of happiness at the end of life. If these people encourage each other and bring others to say the Name, they are all called "people who practice great compassion." Why is the encouragement of saying the Name in faith an act of compassion? Shinran says - because „the nembutsu alone is true and real,” because nembutsu is the only escape from repeated births and deaths in which we have been caught since the beginingless time; because nembutsu is not the creation of our unenlightened minds, but the ship Amida manifested to carry us from samsara to Nirvana. It is true and real, because the effect of nembutsu is the uncreated reality of Buddhahood that we’ll experience upon birth in the Pure Land. To help one another entrust in the nembutsu is the only true help we can receive and give to others. This is indeed the meaning of genuine spiritual friendship. This equality is not related to status or rank only, but also to wisdom or learning, as we clearly see from the Postcript of Tannisho when Shinran Shonin says that between him and his Master Honen, there is no difference in shinjin, although Honen posseses greater knowledge and learning. 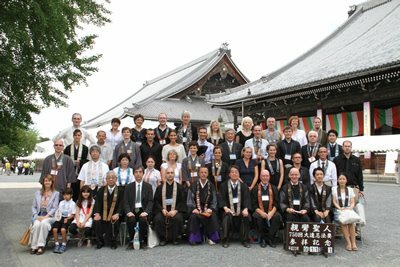 Unlike other Buddhist schools, in Jodo Shinshu there are no gurus nor superior lamas and teachers, but only friends on the path. This is because everything we receive - shinjin and nembutsu - comes from Amida Buddha. Here the teachers are only good friends and guides, and everybody can be the teacher of others if he or she has already received shinjin from Amida. We become spiritual friends in the sangha because the matter of birth and death is important to us, because we share the same interest in learning the Dharma and the same faith in Amida Buddha. Nobody is enlightened among us, nobody is even near to Enlightement, so nobody is superior to one another. This is why, for example, in our dojo there are no special Dharma chairs for teachers and we sit on the same level when chanting or listening the Dharma. Our nembutsu friends accompany us in this life and watch over us from beyond until we all meet again as Buddhas in Sukhavati. Letter 12 On Semimonthly Meetings, fascicle IV from Rennyo Shonin Ofumi. The three kinds of offering are: the offering of material gifts like food, drink, clothes, the offering of life and the offering of Dharma (Dharma dana). KGSS, chapter 3, section on the true disciple of the Buddha. Thus I Have Heard from Rennyo Shonin, translated by Zuio Hisao Inagaki; printed by Dharma Lion Publications, 2008. Seikaku in the same Essentials of Faith Alone.